Maintain precise management of inventories and product flow within your business. Ensure that all of your incoming and outgoing items are accounted for and are able to be tracked and located easily. Achieve complete control over both the purchasing and sales side of your inventory. Adagio excels in managing inventories in wholesale distribution through multi-locational stock management and control system. Inventory control tracks purchases, receipts, shipments, returns and adjustments in order for users to attain a thorough overview of inventory related activities. Store thorough purchase history, track outstanding purchase orders, and generate customized purchase orders that can be easily delivered to suppliers. It is crucial to have an order entry program that is capable of handling multiple price lists, tracking backorders, invoices, customized order forms and confirmations in sales. 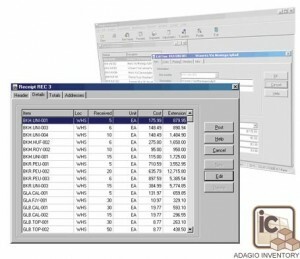 Adagio Sales CQ, and Order Entry systems will make order takers fully informed when interacting with customers. Detailed reporting ensures a focused business plan and allows for quality reference.